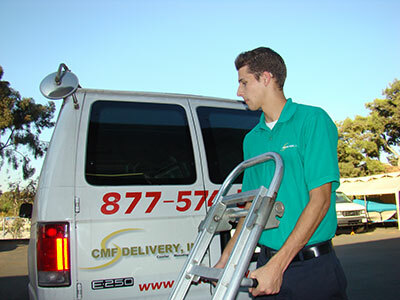 CMF Delivery Services - Why Choose CMF Delivery? We have been in the business for over 30 years. We service small business to large corporations. We have radio dispatched, uniformed, professional drivers. All our drivers pass an extensive background check. We have fully computerized, custom billing. All our vehicles are monitored using a GPS tracking system. On time delivery with free P.O.D., either by phone or E-mail, or FAX. We use two-way Nextel radio communication. We are insured, bonded and licensed by DMV/CHP, Motor Carrier permit - CA #.